Come and visit your local community garden, orchard, wildlife meadow and eco-building. 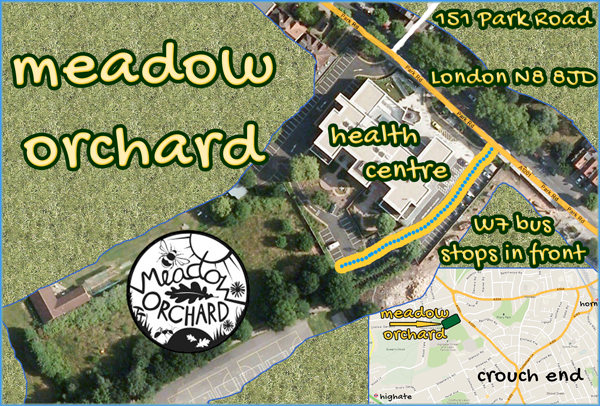 The Meadow Orchard (behind the new health centre in Crouch End) has an open day this Saturday and we've organised a 'culture concert' with troubadour Michael Hart, starting at tea time. This is a free event but please consider a 'pay what you want' donation on the day - we've tried not to spend any money but cannot avoid some costs. Please go to our Facebook page and click the 'going' button on the top right. Or email us at Sat7thJuly@TransitionCrouchEnd.org.uk and let us know you're coming, and if you intend to contribute. This is an opportunity to help create a cultural event that is worth your while attending - something you would want to go to again. Many of us who live in Crouch End are creative performers, and even more are supporters of cultural activities. We have enough people, places and skills to make our own cultural events, so what would you like to see happen? Join us at this one so your voice can be heard. 5:30pm Michael Holt, troubadour, will entertain us in a 'salon' format with his music and conduct a talking circle about a change of culture in our community. 7:30pm Gather round as a group to continue the conversation, interspersed with contributions of reading, poetry, storytelling and singing - whatever the audience brings. 8:30pm Bicycle-powered cinema - the 55 inch screen is quite small, so should be easy to power - please take turns to pedal so we can see an eclectic program of short films. Food and drink to share, and your own plates/cups etc - we don't do disposable and expect to leave the meadow as we found it, and create no waste. Something warm if you stay after dark in case it gets cold. Something to sit on - a blanket or something you can lay on the ground. An except/paragraph/page from something you would like to share with us - maybe a passage from a written work, your own or from a published author. A poem, a speech, a reflection, a story, a song - anything you want. This is a gentle chance to get involved - no spotlights, just a group of nice people gathering round and sharing what they wish to share. A sense of humour and a willingness to smile at people.